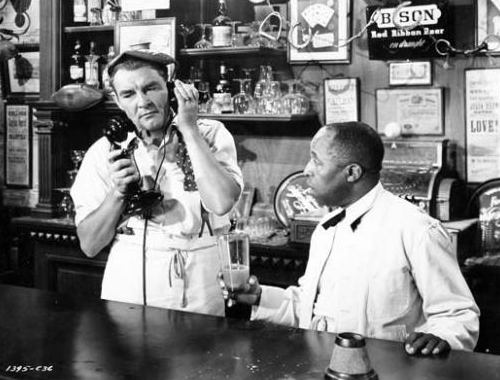 Radio Spirits » Blog Archive » Happy Birthday, Eddie Green! Posted on August 16, 2016, 8:00 am, by Ivan G. Shreve, Jr., under Birthday, Classic movies, Radio comedy, Radio drama, Radio variety. ARCHIE: Eddie, uh…get me a pail of hot water and a mop, will ya? EDDIE: What for, you gonna take a bath? EDDIE: You? Going to work? ARCHIE: Is it such a surprise? EDDIE: Whatever you got, I don’t wanna catch it…look, how come you suddenly wanna do my work? ARCHIE: Eddie…just because a guy wants to help people, do you have to be suspicious? EDDIE: If the guy is you, and the people is me…yes!!! The actor who played “Eddie the Waiter”—essentially the “Rochester” to Duffy’s Tavern star Ed Gardner’s “Jack Benny”—was born in Baltimore, MD on this date in 1896. Eddie Green was a show business veteran at the age of seven, performing as a “boy magician” for a number of churches in and around the Baltimore area. By fifteen, he was hiring halls in nearby towns and making money with his prestidigitation. He would abandon his magic act by the time he entered vaudeville, where he earned a hefty salary of $9 a week. Green also became a fixture in burlesque. He spent eleven years working as a right hand man for the legendary Billy Minsky, functioning as both writer and comedian. After leaving Minsky, he started a lucrative career on stage, beginning in 1929 with the musical revue Hot Chocolates. (Chocolates served as the Broadway debut for Louis “Satchmo” Armstrong, and also featured James Baskett, future Oscar winner for Song of the South.) 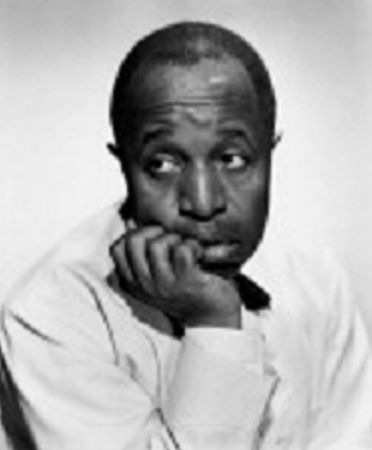 Other shows that utilized Eddie’s comedic talents include Blackberries of 1932 (for which he wrote the book), A Woman’s a Fool—to Be Clever (1938), and The Hot Mikado (1939; an all-black version of the Gilbert and Sullivan operetta). 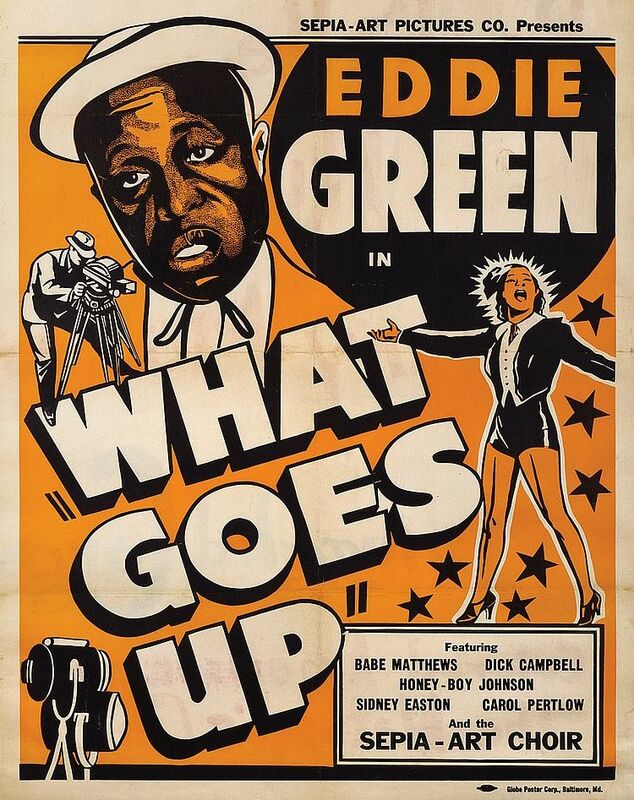 Eddie’s fame as a Broadway performer would later extend to the world of motion pictures. He made his “talkie” movie debut in a 1929 Vitaphone short, Sending a Wire. Like the pioneering writer-director-producer Oscar Micheaux, Green later participated in what were known at the time as “race pictures”—films produced with African-American audiences solely in mind. 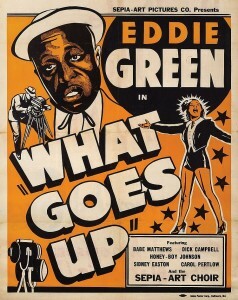 Eddie wrote, directed, and starred in such features as What Goes Up (1939) and Mr. Adam’s Bomb (1949), and was the producer of titles like Dress Rehearsal (1939) and Comes Midnight (1940). Green’s other motion picture appearances include Laff Jamboree (1945) and Mantan Messes Up (1946). In a large sense, Eddie Green owed his fruitful radio career to Rudy Vallee—Vallee often featured Eddie on his Fleischmann’s Yeast Hour, Royal Gelatin Hour, and Sealtest shows. 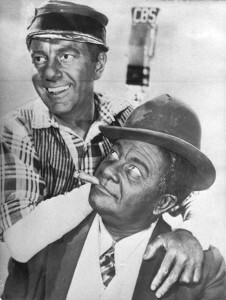 Green was also a regular on his old friend Louis Armstrong’s variety series in 1937, where he performed sketches and routines with Gee Gee James. Other radio shows on which the comedian appeared include The Gibson Family, Maxwell House’s Show Boat, The Jack Benny Program, The New Army Game (with Ben Bernie), Meet the Colonel (a sitcom starring F. Chase “Colonel Stoopnagle” Taylor), The Pursuit of Happiness, The Columbia Workshop, The Fabulous Dr. Tweedy, and The Philco Radio Hall of Fame. Eddie was also a frequent performer on Jubilee, an AFRS series spotlighting top African-American talent (Lena Horne, Ernest Whitman, Leadbelly, etc. ), and joshed with radio boss Ed Gardner on installments of AFRS’ Mail Call. The program that would eventually develop into Duffy’s Tavern was first auditioned on the CBS series Forecast. Technically, Green wouldn’t join Duffy’s until the show premiered over CBS in March of 1941—but he did appear on a Forecast broadcast with the legendary Paul Robson in a production of “All God’s Children” (08/26/40). 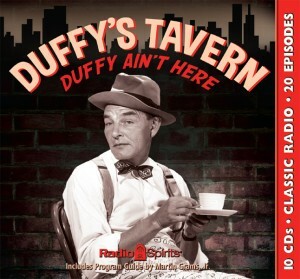 Duffy’s would prove to be a splendid showcase for Eddie—the waiter character even shared the same surname, and as OTR historian John Dunning shrewdly observed, Green’s “cunning dialogue contained some of the show’s funniest lines.” (An interesting note is that Eddie was no stranger to the craft of waiting on tables; he also dabbled in the food business, maintaining a chain of Harlem-based restaurants for a number of decades.) Eddie, along with Duffy’s co-star Charlie Cantor (a.k.a. 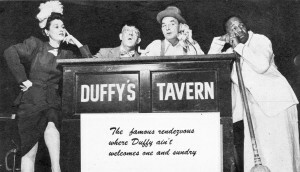 “Clifton Finnegan”), would reprise his famous radio role when Ed Gardner brought Duffy’s Tavern to the big screen in 1945. Considered by many to be a notorious flop, film-wise, the picture actually made money due to its all-star Paramount Pictures cast. At Radio Spirits, we have Eddie on tap in the Duffy’s Tavern collection Duffy Ain’t Here, and you can also hear his hilarious contributions as Stonewall in our newest Amos ‘n’ Andy set Radio’s All-Time Favorites. Happiest of birthdays to you, Eddie Green…you always made listening to the saloon “where the elite meet to eat” a most enjoyable pleasure. « Happy Birthday, Bert Lahr!